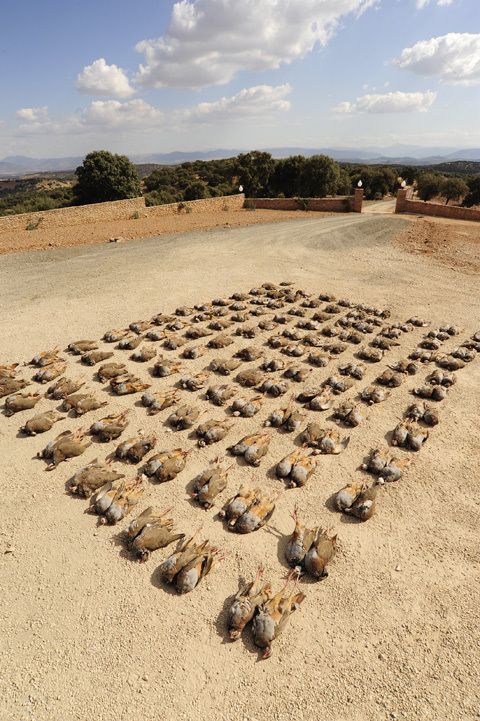 For those guns lucky enough to enjoy the full breadth of sport on offer each season, Spanish partridge shooting has become a regular attraction. As a farmer’s son, I have been shooting for much of my life, and thanks to this magazine I have been lucky enough to try my hand at some fearsomely high birds in the four corners of the UK. Though I can by no means hit every bird that flies over me, neither the hills and valleys of Wales nor the high birds of the south-west of England have gripped me with fear. A trip to La Cuesta de la Borracha in early October last year comprehensively altered my view. I’ve often found myself laughing on shoot days, enjoying some long-forgotten tale recounted by a friend or the latest gossip over a sausage roll at elevenses, but very rarely with a gun in my shoulder. On the final drive at La Cuesta, however, I found myself standing stock-still and laughing in joy and despair as redlegs were reduced to tiny blurs in the clear blue sky overhead. No matter how much my loader or secretario urged, no matter how hard I swung, almost every one flew over unmolested and onto the valley side behind. 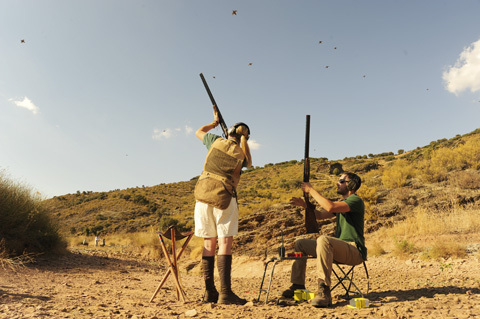 On the three-hour drive south from Madrid to the purpose-built shooting lodge on the edge of the hills in southern La Mancha, sporting agent Nick Mason of Davis & Bowring had done his best to build the anticipation for the sport ahead. As the bustling urban and industrial sites of Madrid gave way to vast black ribbons of tarmac, striking out arrow-straight across open tracts of dusty countryside, he told me of his “very strong” following of English clients who travel to La Cuesta each year in search of “sporting humiliation”. 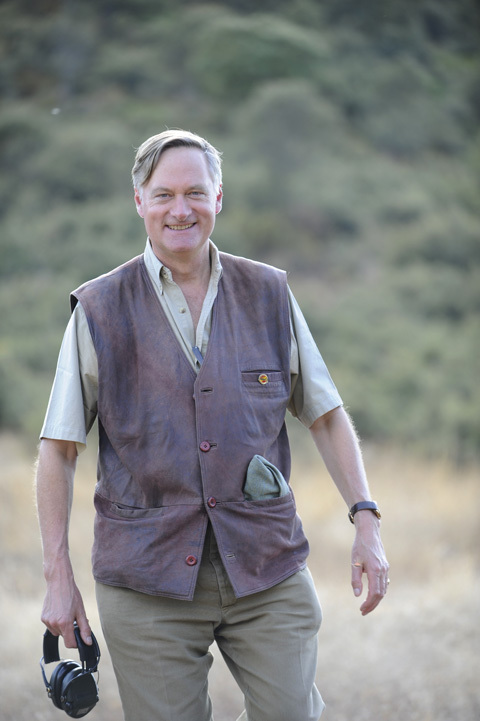 Sporting agent Nick Mason of Davis & Bowring, who has been organising Spanish shooting trips for over 20 years. Fellow gun David Walton backed Nick up, explaining: “I like to be beaten when I shoot. If I shoot one in 10 I’ve had a good day.” If David’s definition was anything to go by, I had an excellent day in the field. Castile-La Mancha is one of the most sparsely populated of the Spanish territories, with just over two million people spread across almost 80,000 square kilometres of land. The estate lies in the hills south of the tiny municipality of Puebla del Príncipe, an area characterised by red soil and olive groves as far as the eye can see. La Cuesta is hugely important to the area: owner Jesús Alberto Muela employs 28 full-time staff to run all aspects of the estate, from the chef and house staff to the drivers who move the guns around in estate 4x4s and the gamekeepers. This number rises to well over 40 on shoot days. Jesus Muela (left) with son Jesus Alberto Muela. A long, dusty road leads up to the finca (lodge), purpose-built in 1999 to house teams of guns in splendour. There is room to land a helicopter should you so desire, however you need not be up in the sky to take in one of the estate’s greatest assets – the amazing views. Sitting on the huge dining terrace with a beer in hand, the sun setting behind the hills, you will think you’re in heaven before even a hint of sport takes place. The lodge makes the most of vast horizons of open sky, rolling hills and the steep-sided valleys of the Sierra Alcaraz and Morena, and overlooks some of the estate’s best drives. The terrain is excellent territory for shooting, and the keen-eyed gun will drink in every contour in preparation for the sport ahead. Second on the list of La Cuesta’s many wonders is food. From the simple platters of bread sticks and thinly sliced Serrano ham to Michelin Star-standard feasts cooked by the resident chef, there is much for the gourmand to appreciate. Lunch is taken in the field, either al fresco or in a purpose-built hut, though describing it thus really is doing it a great disservice – it is more of a house, certainly big enough to live in, with its own garden, indoor and outdoor dining tables and a bar. “I always say shooting is something you do in between eating and drinking, and that’s very true in Spain,” Nick said over lunch, as cold sherry was poured for the thirsty guns. The Spanish have their priorities straight, and it was only the unrelenting heat in which we were shooting that stopped me from having to buy an extra seat on the plane for the return flight. 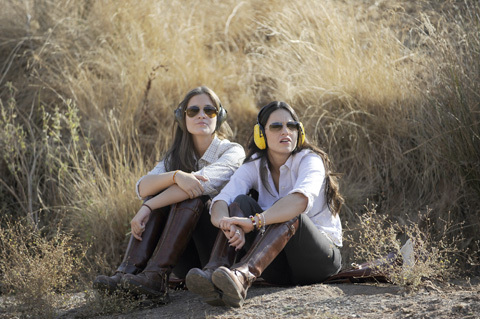 Partridge shooting at La Cuesta is a surprisingly energetic experience. Each drive begins with the end gun reeling off two rapid-fire shots – a lively and exciting way to start. Your loader (cargador) sits in front of you, a clever folding walking stool incorporating a tray on which lines of cartridges are immaculately laid out to facilitate rapid loading of the double guns. Behind, a secretario (bird boy) stands with his dog, counting your shots fired and birds killed. Both offer huge encouragement throughout, applauding your good shots and urging you on through the really high birds. At La Cuesta your loader sits in front of you – some find this disconcerting at first but the author soon got used to it. Although initially a little off-putting, the sight of a loader in front of you soon becomes comforting, as the guns are swapped between you with increasing speed and precision. Moreover, the birds are all so high there is very little danger of your muzzles ever being pointed anywhere but the sky. These explosions of excitement seem to burst up and down the line; guns, secretarios and loaders alike all bellowing their approval. But behind the adrenaline and sheer noise and joy of it all runs a slick machine. Each gun is allotted a share of the overall bag for the duration of the trip, and each gun has their totals individually counted. For every bird shot the secretarios will gesture and bark in their native tongue to apportion the kill to one of the guns. Though this individual scoring might be a little unwelcome for the more traditional gun, it means each participant can easily keep track of his position in the day. And the team can avoid falling into the tricky trap of shooting too many birds, or the contract being fulfilled after a couple of drives. Watching the shooting at La Cuesta is thirsty work and it pays to take the weight off your legs! La Cuesta is not all about high birds. Jesús Alberto’s father, also called Jesús, ran a game dealing business as well as organising staff for other shoots in the region. 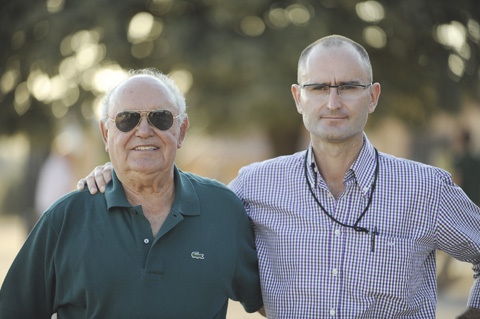 Jesús Alberto saw an opportunity to buy into a partridge shooting estate in 1994 in the shape of the nearby Las Beatas estate, which included large areas of sporting leases as part of a house sale. “I became a part of my family’s business, but I really love to work in the countryside and organise shooting,” Jesús Alberto told me. “So, when the chance to take on Las Beatas came up I couldn’t miss it. I met Nick shortly after, and that was when I decided to focus on having really high, strong birds. The land around Las Beatas is great for traditional Spanish partridge shooting, where the birds are relatively low, but the land wasn’t quite right for showing the type of birds I wanted. The day’s impressive bag laid out proudly beneath the scorching Spanish sun. The size of the estate goes some way to explaining the crescendo of noise when a magpie appears over the guns. For keepers on estates of any size, predator control is probably the most arduous task, so attempting to keep down their populations over 41,500 acres must be quite vexing. Given that the keeping team shoots between 400-500 foxes on the estate each year, I can only imagine what would happen should one be foolish enough to appear on shoot day. During my visit, this enthusiasm shone through at all times: Jesús was seemingly ever-present, ensuring every gun was well looked after and enjoyed sufficient partridge shooting. Every aspect of the estate is carefully thought out and Nick told me that he even sends away dead birds for testing to ensure any diseases can be quickly picked up and treated. This level of care and attention in all aspects of estate organisation results in truly outstanding partridge shooting, with very strong birds flying at supreme heights and speeds that would certainly test the mettle of any gun I have ever met. 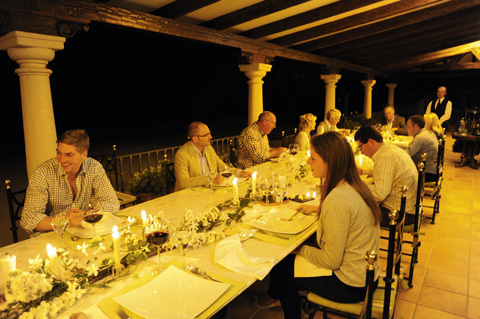 After a day’s shooting, supper can be taken in the cool evening air of the lodge’s grand terrace. Though the setting is grand and the sport imposing and impressive, Jesús’s real triumph is in the atmosphere he has managed to create. Every gun is made to feel extremely welcome and very much at home; even in the rather grand surroundings of the lodge with its 14 luxurious rooms, a warm, intimate feeling prevails. And the hospitality skills required to achieve this should not be under-estimated. For more information contact Davis & Bowring on 01524 271151, email sporting@davis-bowring.co.uk or visit www.davis-bowring.co.uk.